You are currently browsing the tag archive for the ‘Heat Island Effect’ tag. 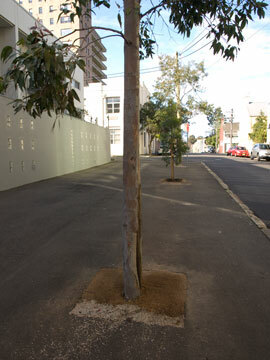 Nine 3-metre tall Queensland Brushbox trees have been planted in in-road tree pits on busy Concord Street Erskineville. Each tree has 5 ag-pipes installed for watering. These trees will add a wonderful large canopy here, cooling the street, adding beauty & providing for wildlife. A very large public herb garden has been installed in Bray Street. This garden, which had an olive tree in the centre, has been reclaimed from the road. The garden slows down traffic, coools the area, brings the community together & adds beauty – an all round winner. 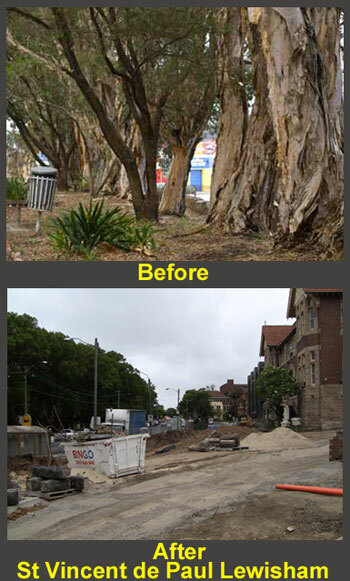 The City of Sydney Council has done some amazing street work that will benefit the community & wildlife immensely. 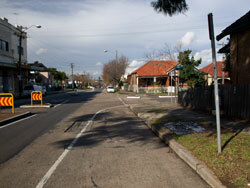 I first noticed the work beginning on Concord Street Erskineville around a month ago while we were out cycling. The cycle path here is great & very safe because concrete blocks prevent vehicles from parking in the bicycle lane. This is a big plus as far as I am concerned. We returned today to have a look at what has been done. Put simply, it is fantastic. 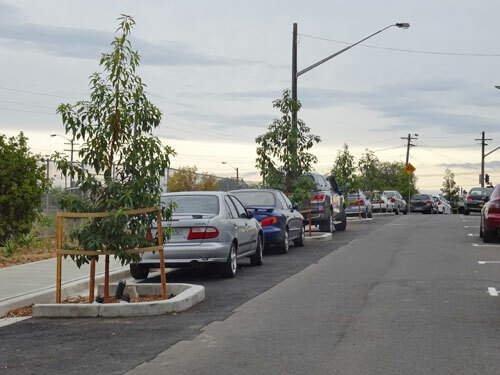 Nine 3-metre tall Queensland Brushbox trees have been planted in in-road tree pits on the railway line side of busy Concord Street. Each tree has five ag-pipes installed for the Council to easily water them. There is a space for two cars between each street tree giving the trees plenty of room to grow to their full size without their canopy being compromised. Cars cannot park close to their trunks & there are no overhead power lines either. 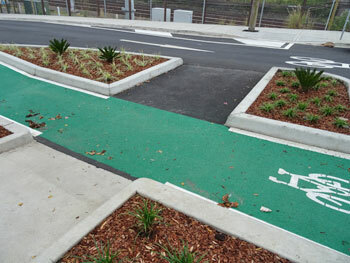 Showing part of a an in-road verge garden with bicycle lane in Concord Street. 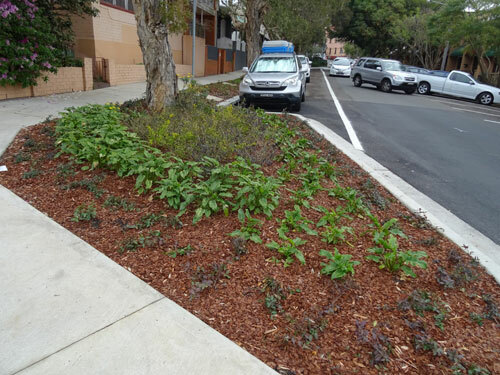 The City of Sydney Council is committed to lowering their urban heat island effect, so are planting street trees, removing concrete & planting verge gardens & green walls to help them achieve this. 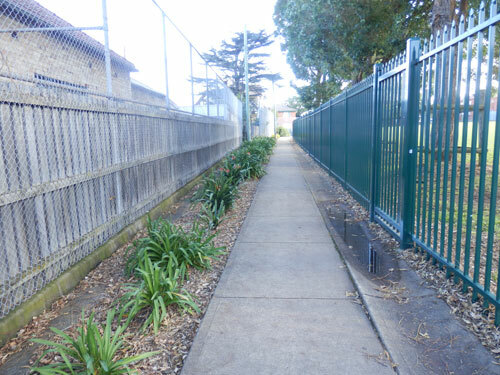 Instead of taking the concrete footpath all the way to the fence of the railway line, they have left a substantial sized area next to the railway line fence. In this space are planted native lilies, native grasses & Wattle trees. With Wattle being fast growing, this area will look fabulous & green in no time. 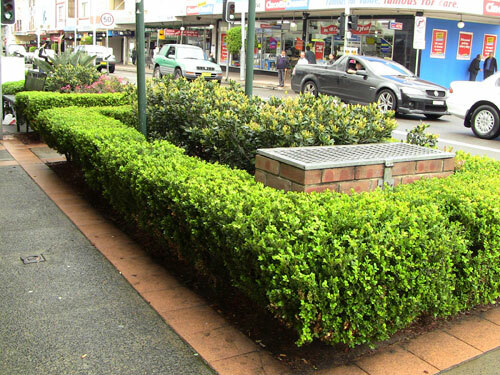 On the right side of the footpath are the Brushbox trees. The trees will serve to block the sight of the railway line, as well as reduce the noise of passing trains. As Sydney Park is just across the railway line & Sydney Park Road, these trees & verge gardens provide a continuity of habitat for wildlife, especially birds. Showing part of the corner of Bray & Concord Streets. Large gardens have been installed where there was road. These serve to slow down traffic. Plus they add beauty. Across the road is parking that is separated from the bicycle lane. Then comes a continuous verge garden that runs all the way to Concord Lane just a building away from the end of King Street. In this block they have planted a Tuckeroo tree. All the street trees have been retained & a new tree planted where there is a gap. The verge garden is mulched from beginning to end, not just around the trees. Native violets, lilies & grasses, plus other plants I do not know have been planted & it looks fabulous. The width of the verge garden is the same width as the footpath. To allow people to travel to their cars, large attractive sandstone pavers have been placed to allow walking across the verge garden. There are no trip hazards either. At the corner of Concord & Bray Street half the road width has been reclaimed & large verge gardens have been planted on either side. These gardens slow down traffic, as well as allowing the area to be greened & made beautiful. 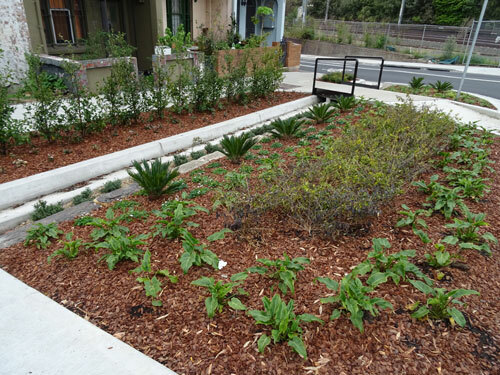 These gardens also include a small rain garden channel beside the gutter, which is filled with plants. What a great idea! Lilly Pillies have been used as a screening hedge along the footpath. Both sides of almost the whole of Bray Street to Bray Lane have been turned into a continuous wide verge garden. Previous in-road verge gardens have been retained. The street is green & leafy. Once the verge gardens mature, the beauty of the streetscape will increase exponentially. The use of large sandstone pavers to allow people to travel to cars has been used here as well. At the King Street end of Bray Street a large section of the road on both sides has been reclaimed for in-road gardens. One side has been planted by Council. However, it appears that residents have requested that the south side garden be left to them to create a herb garden for the street. 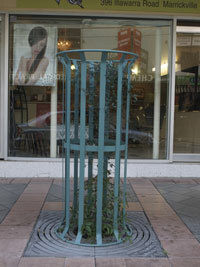 An olive tree has been planted in this in-road garden. It was interesting to watch young people stop to read the signs of the herbs & pick to smell. They spent 15-minutes here before walking on. This is a great way to passively educate about the environment & how verge gardens can be used to benefit the community, as well as provide beauty & increase livability. This herb garden is something that will unite many of the residents of this street & help community building. It is large enough for many to become involved in the planting & care of this patch. I was impressed. 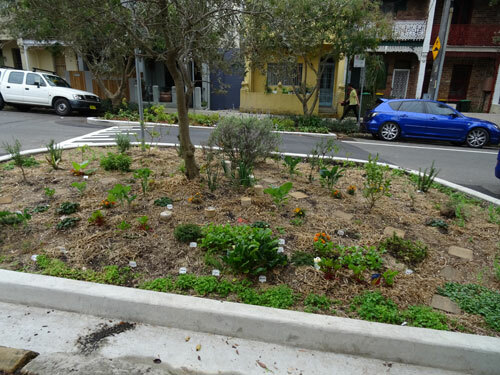 The City of Sydney Council has shown that even in the densely populated & busy streets of Erskineville the streetscape can be markedly improved both for the benefit of people & wildlife. The work they have done is beautiful & I will return in a year to review its growth. All local councils can learn from this approach to streetscape creation. Gone is at least half of the concrete & the space filled with street trees & a variety of plants. Even the use of native grasses was minimized showing that there are other plants that can be planted by local councils in verge gardens. Really well done City of Sydney Council. This photo shows how much of the road has been reclaimed for gardens. The driveway to the gardage is now metres longer. Showing another corner of reclaimed road. 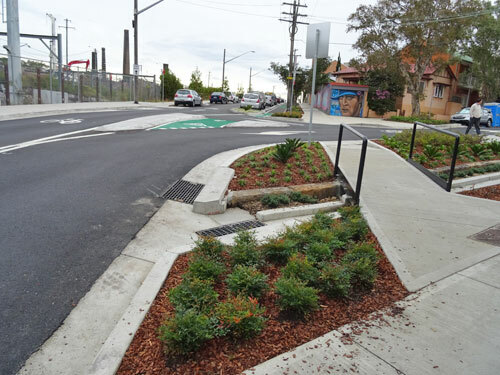 There is design in the plants used & the council has not resorted to planting only native grasses. Typical of the City of Sydney the street is filled with tall street trees, including Hill’s Fig trees. A single verge runs for the whole of Bray Street on both sides of the street. It already looks fantastic. A bicycle lane and a verge garden that is as wide as the concrete footpath runs the full length of this section of Concord Street. The other side also has a wide contineous garden, plus in-road plantings of Queensland Brushbox trees. Mulch is used everywhere, not just around trees or plants. Also they have used a variety of plants. Another corner verge garden that used to be road. This is in Bray Street. This is an amazing verge garden on the corner of Concord & Bray Streets. 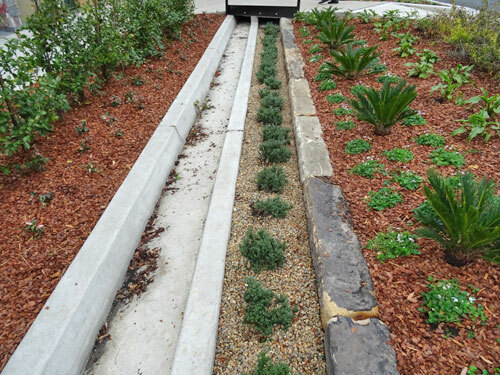 They have planted a Lilly Pilly hedge, a variety of plants & added a raingarden channel next to the gutter. Showing thr channel rain garden. How clever is that. Look at the variety of plants. Showing the same corner, but from the downhill side. 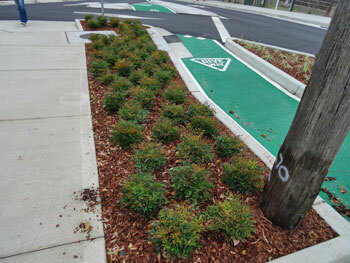 Marrickville Council has created some lovely sections of landscaping along the Marrickville Road shopping strip. These gardens help to lower the urban heat island effect if there are enough of them. 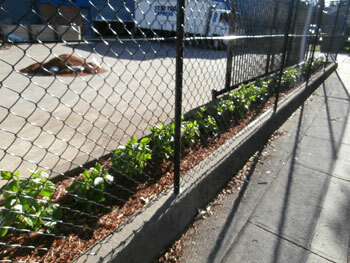 Residents have planted along their fence line in a Stanmore laneway. 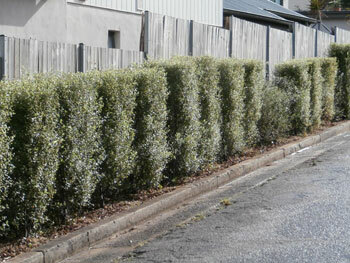 This hedge not only brings beauty, it also helps lowers the urban heat island effect. The increased density from the building of high-rise buildings also increases the urban heat island effect. This is important for our area as Marrickville Council has plans for areas across the municipality to become high-rise apartment housing. The researchers found that heat accumulated during the day resulted in increased nighttime temperatures. Obviously this will lead to a higher need to use air conditioning resulting in bigger power bills. The researchers are recommending to urban planners to incorporate more green spaces, trees & bodies of water in developments to prevent the storing of heat during the day & also allow for evaporation, which lowers nighttime temperature. 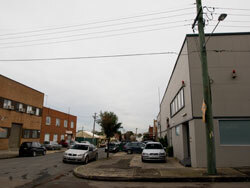 A factory between Renwick & Carey Streets Marrickville recently planted 260 plants to form a hedge. This will help combat the heat generated from their concrete carparks & add beauty, plus habitat. On the second day of spring, Sydney’s temperature reached 31-degrees (87.8F). On the seventh day of spring, the temperature reached 32-degrees (89.6F). This is summer weather. The 7th September was the hottest September day since weather monitoring started 150-years ago. Al Gore warned about this in 2006 saying Sydney would become a subtropical zone with weather more like Brisbane’s. For Sydney, this is predicted to mean higher humidity, hot wet summers, drier milder winters with much less annual rainfall & a greater chance of drought. 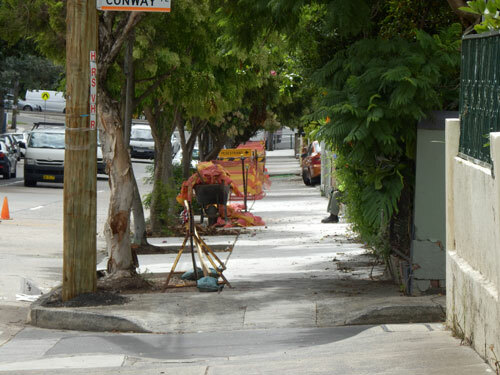 Marrickville Council have planted a pedestrian laneway in Dulwich Hill. Greenery like this is accumulative in helping to lower heat. 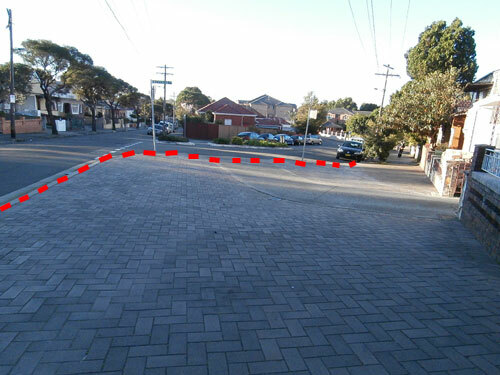 I don’t understand why this vast area of footpath in Petersham Road Marrickville does not have 2-3 street trees. It’s baking hot here in summer. 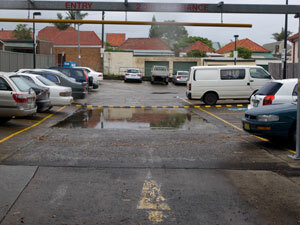 This is the Frampton Street car park in Marrickville. Many residents are concerned about the heat it generates as well as the ugliness. Verge gardens along here will make it a much nicer place to live & walk. I had been told about new verge gardens being created by Marrickville Council on Unwins Bridge Road, but had no idea where on this lengthy road they were or how much depaving was being done. 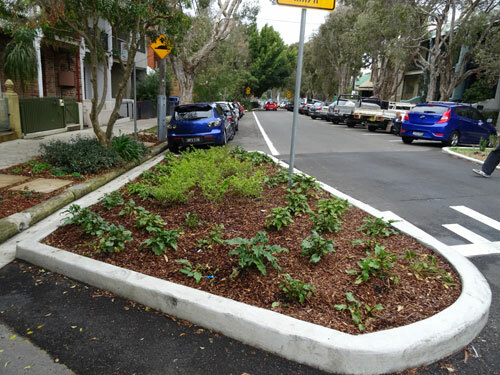 Marrickville Council has created 32 new verge gardens from almost the corner of Campbell Street all the way to Mary Street. Right now it looks like a building site, which it is. When the work is completed though, this stretch on Unwins Bridge Road will look significantly better than it did before. The community & wildlife will be much better off for any depaving & the creation of gardens. Verge gardens & street trees will help with the pollution in this area as the trees & plants will collect particulate matter from passing vehicles. They also help lower the urban heat island effect & add beauty, which adds to property values. Also, a good-looking streetscape makes for a nicer place to live. Imagine how the municipality would look if all the excess concrete was removed & replaced with green plants, more street trees & colour from flowers? 32 new verge gardens in this location is significant. 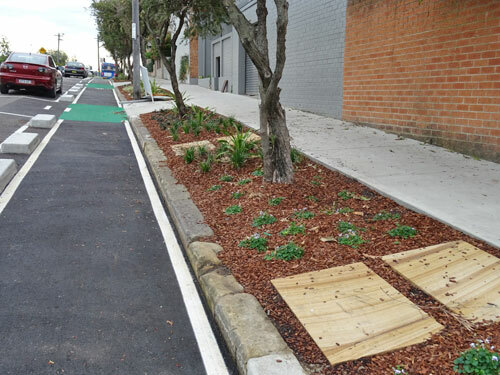 I thank Marrickville Council for doing this & can’t wait to discover their future depaving projects making our municipality a nicer, more attractive, sustainable & healthy place to live. Barcelona in Spain has delivered an amazing 8-storey green wall outside an already standing building, proving that green walls do not need to be the domain of new developments. As the world heats up, this kind of initiative will need to become more commonplace. We cannot continue to create urban environments that are essentially a mix of hard surfaces on different levels – from streets to walls & roofs on high-rise buildings. We will bake unless we make changes to the way we build. 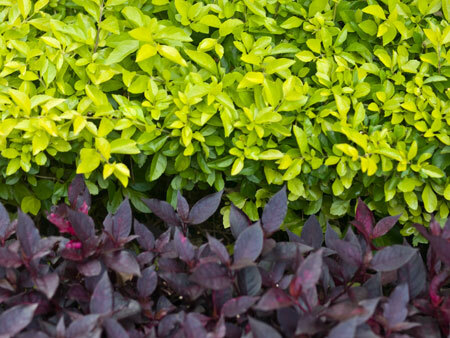 A green wall is not only a living entity; it is also a working entity cleaning up air pollution. Green walls have many benefits. They cool down the building & the local area. They add beauty to the streetscape & have a positive impact on the health & happiness of people who live or work in the building & also those who pass by. 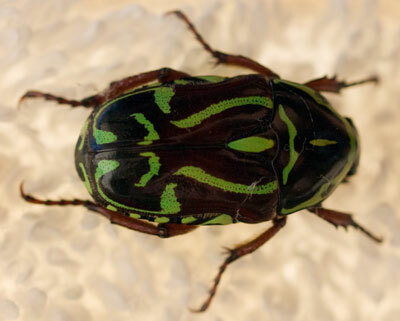 They also add to biodiversity. Green walls make sense, especially as the population increases & land becomes scarcer. What is terrific about this particular green wall in Barcelona is that what was once a large 8-storey blank wall has now been transformed into a living green wall. A scaffold-like structure was built in the air space outside the building. Therefore the plants & the water that is used to keep the plants alive will not impact on the structure of the building, something that concerns many. A staircase & floors have been created between the wall & the building to allow maintenance. The planted boxes are modular & can be removed & replaced. So can plants, making it easy to remove any that may have died. The designing Architect Juli Capella says they have identified seven species of birds that use this particular green wall as well as flying foxes & geckos. These are shown as an interpretive sign near the green wall to educate the public. The green wall has turned into an attraction with a monocular installed so people can zoom in to have a close look at the plants. Initially the locals were worried about the birds & insects & the ‘evils of nature,’ but now are happy with the wall. This could be done here in Marrickville municipality if the owners of buildings were willing & if Marrickville Council encouraged it. Green walls like this one would certainly significantly add to the value of their properties as well as provide the community major inspirational beauty to the streetscape & make it a healthier place to live. If I had my way, all new developments would include green walls in some way because they are so beneficial. In time it will happen, as I believe Architects will not want to be viewed as out of date & out of touch with the community’s desires when other Architects design more people & environmentally friendly office & residential buildings. Until then we can look at what is happening overseas as well as in the City of Sydney Council area, as they are embracing green walls with a passion to make Sydney a very livable city. 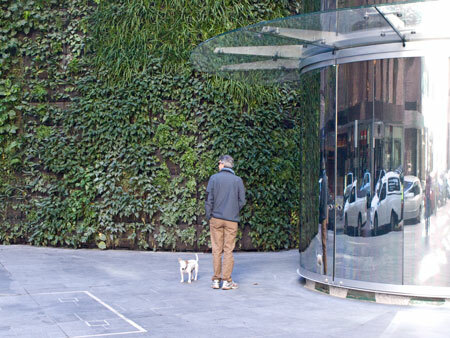 A small section of the glorious living green wall outside the new Cbus tower in Sydney CBD when it was very new. This green wall is a vastly different design & structure than the one in Barcelona. The little green shapes are a flock of Red Rumped parrots eating the grass seeds on the playing fields of Tempe Reserve. There were at least 80 birds eating here just yesterday, though they were impossible to photograph as a group. If this area is covered with synthetic turf these & other birds will lose this important food source. Following on from Part 1 http://bit.ly/K54Jvr Marrickville Council has released its Recreation Needs Research Strategy for public comment. Only 1.27% of the population participated in the community consultation opportunities. 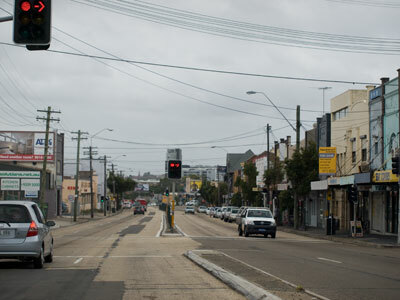 The results are now up on ‘Your Say Marrickville’ & the community is being asked to comment by 6th June 2012. Council also wants to do “synthetic conversions of sports field open space to increase usability,” & for Tempe Reserve, introduce synthetic surfaces on the vast area of playing fields. I do not want synthetic surfaces used anywhere in the LGA, least of all in Tempe Reserve. Playing fields are not just used by sporting people. A range of birds such as Magpies, Red Rumped parrots, Magpie Larks, White-Faced Herons, Masked lapwings & Australian Ibis use the playing fields as a food source by either eating the grass-seed or by digging for worms & other small insects. To cover such a large expanse in plastic will not only kill off all living things, including microbes, but will also remove an important food source for a population of birds already stressed by lack of habitat. Synthetic turf will create further problems when it rains allowing all the rubbish, including plastic bottles, to wash into the Cooks River. I’ve stood in Tempe Reserve & watched litter wash over the grass & into the Cooks River. It will be much easier with synthetic turf. Covering sporting fields with synthetic turf will allow Marrickville Council to get much more money from hiring out the fields because they can lease the fields year round, but it will be done at great cost to the environment & the rest of the community. It should not happen & I am appalled that it has even been suggested. It is made from petroleum products ie. recycled car tyres & frequently contains heavy metals such as lead, aluminium, chromium, copper & sulphur. Making the turf produces carbon, while ordinary grass removes carbon from the atmosphere. It smells like old tyres. It is laid on road base so gets very hot. On a hot day artificial turf can be up to 50% hotter then natural turf, so it contributes to the urban heat island effect. Granulated rubber is brushed into the synthetic grass after it is laid. Playing on this sort of heat can’t be good for players. It causes turf-burn sports injury. It needs to be washed with a cleaning liquid to maintain shine & to disinfect from substances such as blood, spit, urine, vomit, food, beverages & animal excreta weekly during use. This water then goes into the surrounding environment. It has a life span of 10-years & then goes to landfill. Any air-born weeds that take hold need to be sprayed with weed killers & the chemical stays on the artificial turf. I think these are more than enough reasons why installing synthetic turf is not a good idea. There is plenty more studies to show that communities have stopped using the product because of the problems associated with it. Council says Tempe Reserve has “poor drainage & dangerous surfaces by sports users & careful consideration needs to taken to ensure that this large area of multi use open space is maximised.” The $300,000 Mackey Park upgrade used sand under the field as part of the drainage system. More work on the fields was done on at least 2 occasions shortly after completion. The grass species they used is fragile & deteriorates very quickly. The ground is uneven with holes in the sand making even a walker be aware of where they are stepping. A soccer Dad & friend said that the field was too soft & more suitable to a professional pitch that endures less games, as opposed to a community park with more frequent games as the pitch can’t recover from frequent damage. One thing that alarmed me about the upgrade of Mackey Park is when I noticed the lack of wildlife. Prior to the upgrade this park had hundreds of birds on the fields mornings & afternoons when there were no games, including White-Faced Herons. Now it is almost devoid of wildlife as really, very little can live in dry sand. I would not like this to happen for other sporting fields. Marrickville Council’s Biodiversity Plan strives to increase habitat & biodiversity, yet their planned upgrades of huge areas by covering them with synthetic turf will remove even greater areas of food source for wildlife. This does not fit with Council’s aim to increase biodiversity. More trees around the perimeter of the sporting fields of Tempe Reserve are needed. Trees will not impact on the ability to play sports, but will offer much needed shade for spectators & provide a buffer for the wind that often makes this park a miserable place to be. Trees will also provide food & habitat for wildlife. Council offers a summary of the Recreation Needs Research Strategy, but this doesn’t discuss the finer points. I will write more about the other issues of interest in Part 3. This is a Google map of Tempe Reserve. The park is surrounded on 3 sides by the Cooks River. I’ve left the housing in to give an idea of how large this park is. 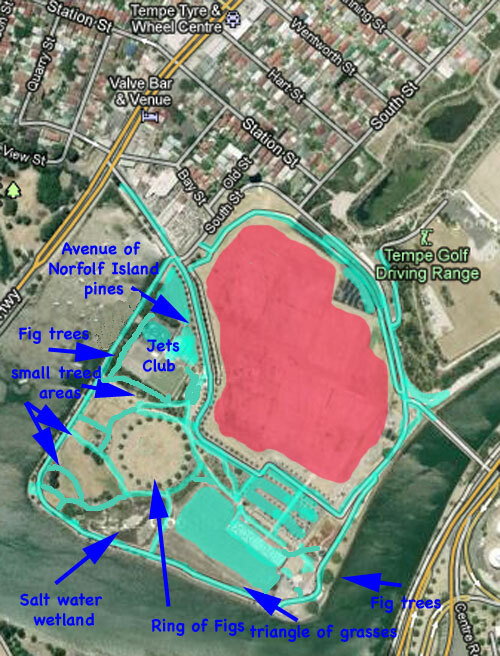 The pink space is the playing fields & where Marrickville Council are suggesting should be covered in synthetic turf. It is opaque so you can see the marks of the actual fields. The turquoise areas are all the hard surfaces – roads, concrete footpaths, bitumen roads & car parks & the buildings (Jets Sporting Club & the Robyn Webster Sports Centre, plus 2 toilet blocks). Although the map is old, the trees are essentially the same. The remaining spaces are lawn grass, except for landscaping (mainly long grasses with some small shrubs), the saltwater wetland & a large triangle of long grasses next to the wetland. If the sporting fields are covered with synthetic turf I believe that more than half the park will be hard surfaces. I had been hearing reports that devastation had happened in front of the St Vincent de Paul Society in Lewisham so we went to have a look for ourselves. The visual impact to the area is phenomenal. What once was a beautiful stretch of trees along both sides of busy West Street is now a wide gaping hole that looks like a scar. The lovely historical buildings of St Vincent de Paul Society that front West Street are for the most part brick & sandstone. In recent years, St Vincent de Paul Society erected a grey glass & steel edifice that is not sympathetic to the surrounding buildings. Things like this are personal taste & I am sure they are happy with the result. The 31 trees that once fronted this site softened this new building & matched the older buildings. Together with the trees on the periphery of Petersham Park they created a green corridor along West Street as you came off Parramatta Road. It is not just the local people who treasure the St Vincent de Paul Society site. I remember when I first saw it in the early 80s when it was still Lewisham Hospital. My reaction was one of stunned, “Wow! This place is gorgeous!” The many magnificent trees that made up front garden combined with the obviously historical buildings made a strong impression on me. Buildings can be beautiful on their own, but most of the time it is the trees that create an atmosphere of wellbeing. As an example I give the ‘Prayer Garden’ within the St Vincent de Paul Society grounds. I don’t know what this area is called, but it is certainly meant for prayer & contemplation because of the life-size-statue of Jesus, the trees, the landscaping & even the graves tucked into a corner. If you removed all the trees from this area, it would no longer be a place of contemplation & peace. It would simply be open space between buildings. This is precisely what has happened at the front of the St Vincent de Paul Society site on West Street. 31 large & mature trees, many with massive trunks, have been removed. This has exposed the buildings, which now look slightly foreboding, especially the newest grey/glass building. I acknowledge that this is a matter of personal perception & this is mine. In place of the trees is a black bitumen driveway & parking spaces. This choice of surface will increase the heat island effect making the area & the buildings hotter in summer. At the far right there were a grove of Melaleucas & some very big & beautiful Eucalypts that framed the stone arch entrance. They too have gone. The car park does not come to this area so removing these trees appears to have been done simply to facilitate the rebuilding of the fence. 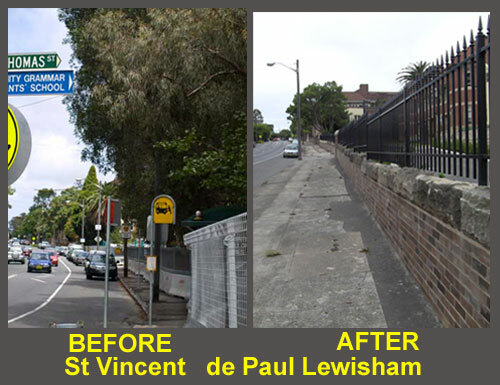 If St Vincent de Paul Society had wanted to, engineers could have easily replaced the fence & kept the trees. Instead, the place has been cleared. Nice little Banksias & Crepe Myrtles have now been planted at wide intervals with other low landscaping plants in a garden bed along the completed section of the new fence. In my opinion, Marrickville Council let the community down when they passed this DA. Even though the trees were on private property, the type of property it is means that it has had a long & active history with the community. The trees were part of the fabric of this Lewisham street & were part of what made Lewisham special. Most people know of this complex, even if they do not know of its new name & purpose. What they remember is the beautiful old buildings & the trees. Question is, are trees valuable enough to be classified part of a community’s history? I think so, but I am not so naïve to not think that others would disagree with me. 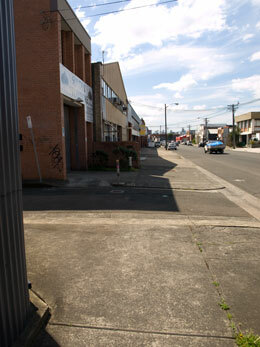 The St Vincent de Paul Society complex is on a main thoroughfare, one block from Parramatta Road. The tall trees with their wide trunks & significant canopy captured & stored much CO2 & particulate matter from passing traffic, preventing this from going into the complex itself, but also further afield into the local community. Then there are the Long-nosed Bandicoots, those small little animals that are classified as ‘endangered species’ & that call this particular patch home. 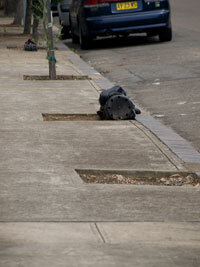 The presence of Bandicoots is another reason why Marrickville Council should not have passed this DA. Endangered Species rely on our Councils to preserve & manage their habitat. The Department of Climate Change, Environment & Water were aghast when I spoke to them last year about the removal of the Long-nosed Bandicoots’ habitat. I last heard that WIRES was negotiating with St Vincent de Paul Society to retain some habitat so the Bandicoots could continue to survive. I will contact WIRES to ask what happened. windy & not good to look at. It is also noisy as the traffic sounds now bounce back from the buildings. whereas before it was much quieter because the trees muffled the traffic noise. There are no overhead cables & the footpath is 3 metres wide so tall-growing large canopy trees can be planted. It would be good if sections of cement could be removed to make long patches of garden greenspace. 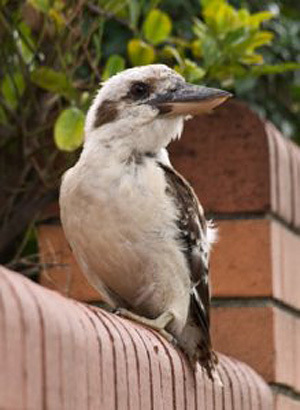 It’s difficult to comment about tree removal on private property, though in this case the trees were an integral part of the streetscape & provided habitat for an Australian native animal that has been classified as an endangered species. 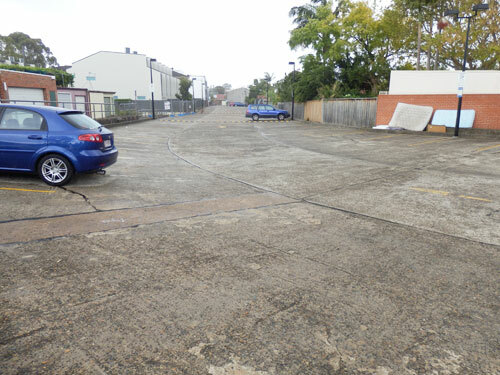 There were many in the community who sincerely thought that St Vincent de Paul Society would keep the trees on the far right of the front of the complex for the Bandicoots, especially as they knew the community were very concerned about the loss of their habitat. I know of a few people who are devastated by the loss of these trees & by how desolate the streetscape of their neighbourhood now looks. A great chunk of our urban forest has gone & there may be more as I understand St Vincent de Paul Society intend to remove other large Eucalypts throughout the complex. Rubber footpaths are made from recycled tyres making them environmentally sustainable as the reuse of tyres stops millions going into landfill or being burnt & polluting the atmosphere. Some products also include low-density polyethylene plastic, again diverting from landfill. The downside is that rubber footpaths are more expensive than laying concrete. However, they are modular in design allowing them to be lifted in segments & repaired or the segment replaced if they become overly damaged. Rubber footpaths are expected to last 15-plus years, whereas concrete is graded at 5-years. Unlike concrete, they will not crack & ruin because of tree roots. 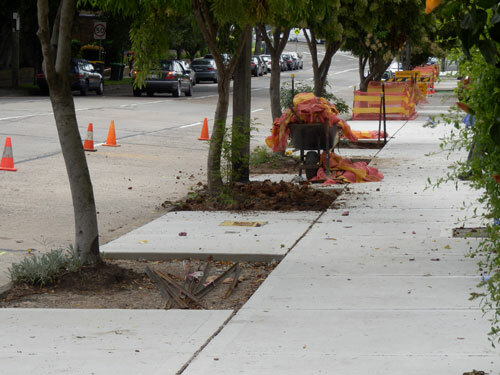 In the US 80% of the damage to sidewalks is caused by tree roots. I couldn’t find statistics for Australia, but it’s likely to be similar, though I think the US has overall many more street trees than we do which may raise the percentage of damage. Rubber footpaths are flexible & interlocking so they will undulate over any tree roots on the surface. They have a channel design underneath that facilitates root growth & assists with water drainage. 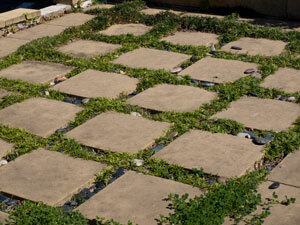 They are permeable allowing both air & water to travel through them. This helps immensely with the health & longevity of the street tree & apparently, the street tree will grow less surface roots because they no longer need to. 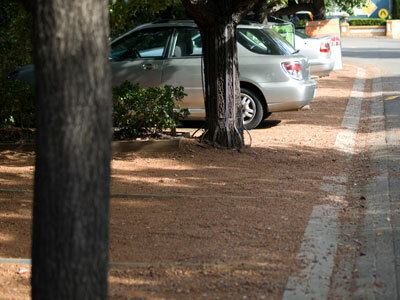 Rubber footpaths retain moisture under the ground, which is also good for street trees. 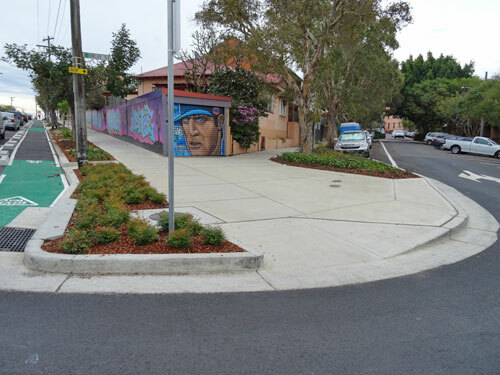 Because rubber footpaths are permeable they significantly reduce stormwater runoff by allowing 100% of the water to enter the ground where it falls resulting in less ground water pollution entering rivers & oceans. Permeability means that puddles don’t form, lessening the chance of accidents. Any falls by people are likely to be less severe as the rubber is much softer than concrete. They don’t create trip hazards like concrete footpaths do. Apparently, rubber footpaths are good to walk on & less likely to cause back, heel & joint problems because they are softer than concrete. They are said to last well with all weather conditions & are not damaged by high heels or bikes, skates & the like. Rubber footpaths come in both light & dark colours & are solar reflective. They don’t lose their colour & many years later look as good as when they were laid. That is unless they are covered in discarded chewing gum. They lower the Heat Island Effect by reflecting heat & by cooling down 25% faster than concrete. Although rubber footpaths are not recommended for anything other than occasional vehicular traffic, they can tolerate 18,143.695 metric tons without breaking, cracking or deforming. This means they will be able to survive traffic over footpaths with vehicles entering & exiting homes. Rubber footpaths can be used over internal concrete flooring & as coverage on flat roofs or for courtyards, garages & garden paths. 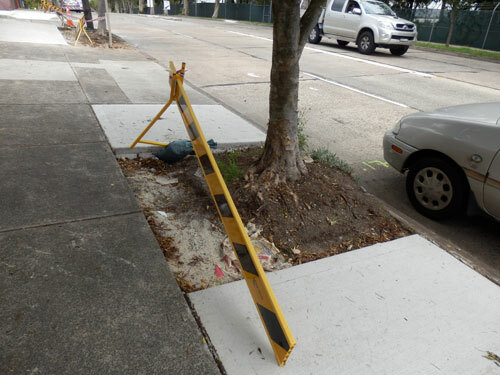 I doubt this kind of footpath will be used for a while in Marrickville LGA because concrete is cheap & easy. However, I do believe that, as the climate gets hotter, this kind of change will become the norm across Australia. There is a push happening in the US as high as President Obama to paint all roofs across the country white. The benefits of white roofs are frankly astounding & it won’t take long before the white roof movement hits Australia in a big way. I suspect there will be resistance to change due to familiarity of red roofs. Also, some people will be concerned about the Feng Shui of white roofs as they represent death or mourning. Red roofs, the colour of most of Australian tiles, means money coming in. Black or dark grey tiles are seen as a cloud of depression & doom hanging over your home & to be avoided. Blue roofs are the worst as they represent water overhead causing the residents to always be drowning in problems. According to the US Department of Energy white roofs keep buildings cooler in summer & slightly warmer in winter & can save 10-15% of energy used for air conditioning. White roofs & light coloured pavements change the solar reflectance (albedo) because the sunlight comes down & is reflected back into space, thereby not adding to the greenhouse gases. White roofs do not add to the Heat Island Effect, something that is going to become a real issue in the years ahead if not enough is done to reduce it. We will all be boiled alive whilst going about our business, literally. Death due to heat will become more commonplace. Manhattan has been found to be 5 degrees (22 F) hotter than surrounding suburbs simply due to the Heat Island Effect. To combat the Heat Island Effect there needs to be a combined approach of planting more shade-producing broad-leaf street trees & more ground vegetation. Asphalt should be removed where possible, especially great expanses like car parks. Of equal importance is installing green roofs & walls or using solar reflective white coatings on both walls & roofs. Research by the US Department of Energy found if all the roofs on Earth were replaced with white roofs & light-coloured cement pavements were used in all cases, the sunlight reflected back into space would be the equivalent of removing all vehicles off the roads worldwide for 11 years. This is significant, hence the push in the US to make all roofs white. If all the walls were white or light coloured, the positive impact would be even greater. If all cars were light-coloured, the car would need less air conditioning to keep it cool. Soon you won’t be able to by a dark-coloured car. The monetary cost of white roofs & light-coloured pavements is equivalent to the cost of materials we use now. White roofs can be used in combination with solar panels. Already available on the market are nanotechnology heat reflective paints that can be painted over roof tiles or sheeting. These reflect between 90-95% of UV, infrared & visual light & prevent heat transfer into the roof space. Tests have shown that roof space under a dark roof can be up to 50 degrees higher than outside air temperature. There has been some resistance to white roofs for fear they will get dirty & look bad within a couple of years. They will, though some products have Titanium Dioxide in them that is said to make the roof self-cleaning. How fast the roof becomes dirty & loses its reflective ability depends on the location of the building & the slope of the roof. The dirt that dulls the white roof is airborne dust & particulate matter from traffic pollution. 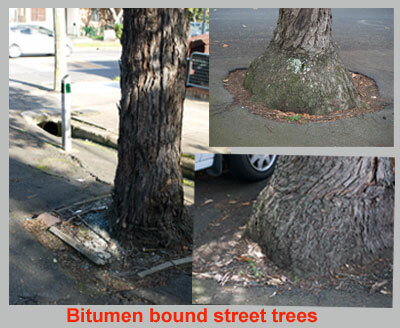 It’s the stuff we breathe in daily & what street trees help prevent coming into our homes. The roof can be power cleaned once or twice a year to return the colour back to sparkling white. I suspect the need to wash one’s roof regularly will be another source of resistance to white roofs. My bet is that eventually governments will offer significant tax rebates for those who have white roofs. Plus power costs will be at nightmare levels so people will be forced to do whatever is available to help keep costs down. I’ve just heard on ABC News tonight a warning that electricity costs will be 100% higher by 2015 & 500% higher by 2020. We will be forced to change & accept sustainable & green cooling & heating methods. That’s when trees are going to undergo a revolution in image & people will return to being tolerant about fallen leaves, wildlife & fixable cracks to paths & fences. People are going to want tall shade-producing trees near their home & on the street because of the tree’s ability to lower power bills by cooling the air. As the Heat Island Effect increases, so does air pollution, especially pollution near the ground & the trees’ natural ability to clean the air will be recognized as a significant benefit. New York City found that the ability to cool an area cheaply & effectively was by planting street trees so they started the 1 Million Trees program. The next best for cooling an area is by creating green roofs, using light covered roof & wall surfaces & planting in open spaces. Australia should be seriously looking at white roofs & white walls. The only exception should be a green roof or green walls with living plants. 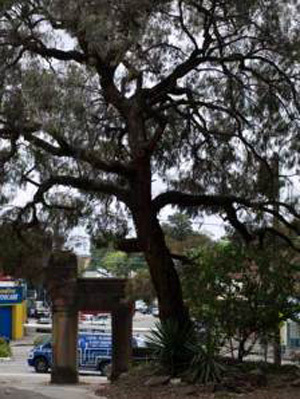 On 16th November 2010 Marrickville Council took its Draft Urban Forest Policy & Strategy to the Council Meeting where it was endorsed. The Urban Forest Policy replaces the Tree Policy, Protection of Trees & Tree Management Policy & is integrated with tree protection measures included in the Draft Development Control Plan 2010. The Draft Marrickville Urban Forest Strategy is a separate document that will be reviewed every 5 years & new priorities set. collected will allow Council to know what their tree asset actually is & the actual location of trees. This information should help Council to: identify areas that have fewer trees & where to focus on planting, assess the health & condition of each public tree, identify when a tree can benefit from maintenance to increase its health & lifespan, keep track of tree loss from death, vandalism or removal by residents or Council, help manage trees more effectively throughout their lifespan, plan for replacement trees in a strategic way rather than piecemeal, increase the community’s awareness about the urban canopy & increase awareness & understanding of trees’ economic, social & environmental value. Take an aerial photograph to see what the actual percentage of canopy is within Marrickville LGA. This will include trees on private land. Hopefully Council will do this every few years so they can see if their urban tree strategy is working & if the canopy is increasing. It will allow them to target areas that need work. 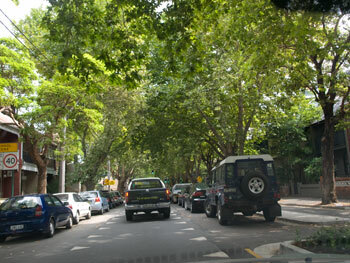 Increase the urban forest including promoting the planting of more trees on private land. 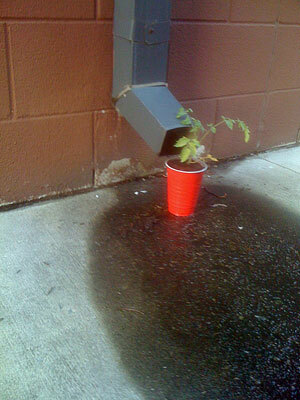 Set up a Street Tree Master Plan. This will allow creation of better looking streetscapes as well as planting larger growing trees where appropriate. A Street Tree Master Plan looks at planting the right tree for the right location. Take a ‘whole of life’ management approach to managing trees. Involve the community in decision-making & care of the urban forest. Identify opportunities for increasing the urban forest on State Government & “Not for Profit” organisation lands. This means that all the wastelands around the LGA could be planted out with trees instead of becoming garbage dumps or areas of long grass & weeds. It will also help do our bit for global warming. Development Applications will be required to include information that will allow Council to assess potential impact on trees. A bond will be set to protect public trees that may be potentially affected by development. One only has to look at the deterioration of the bulk of the Hills Figs in Renwick Street & Carrington Road Marrickville South to see how important this will be. Establish guidelines & procedures to manage insurance claims regarding public trees. Increase the diversity of trees planted. Hopefully the use of ornamental Pears & Prunus varieties will decrease & other species of trees will be used in place of these. My personal opinion is these trees have almost negligible benefit for urban wildlife & there are other species that will create the same effect yet be beneficial. Will look for new places to plant trees. Will not prune or remove trees due to leaf, fruit drop or sap drop, bird or bat droppings or because a branch overhangs private property. Last February Council recommended to the Councillors the removal of 1,000 trees per year for the next 5 years. Their paper specifically targetted ‘senescent’ trees, meaning older trees. This is of serious concern because it is older trees that provide the most benefits both to the community & the environment. To lose these simply because they have been assessed as coming towards or reaching their SULE (safe, useful life expectancy) may be a matter for debate. That Council has clearly stated that they “will involve the community as a key partner in managing the urban forest of Marrickville LGA” gives me great hope that they will actually do this. But I have not found in the new Draft Policy a target number. Perhaps some of these trees that would have been targeted for removal 10 months ago will now be protected. I was very happy with the changes & the new direction Marrickville Council intends to go with the Draft Urban Forest Policy and Strategy. The new policy/strategy appears to me to be quite different than what they presented in February 2010. Much of what it proposers is already happening in many other Councils across Sydney. The new direction can only improve the management of trees & communication with the community. Increasing the tree canopy will benefit everyone & should have a positive impact on urban wildlife. Unfortunately, it’s an aspirational document as many of the plans will remain just plans because Council doesn’t have the money to instigate much of what is in the Draft Urban Forest Policy & Strategy. There isn’t long before the effects of global warming become obvious especially with the heat island effect. All the experts believe that trying to grow trees in these conditions will likely be much harder than today. We need these trees now as they take many years to grow. http://www.marrickville.nsw.gov.au/ & scrolling down to Community Consultations in the left hand column if it is not on their main page. The deadline for community consultation is 2nd February 2010. 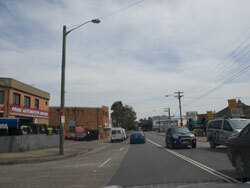 14th December 2010 – Both the Policy & the Strategy are now on Marrickville Council’s website. You can download them here – http://www.marrickville.nsw.gov.au/get_involved/community_consultations/urbanforest.html?s=2018938229 The deadline for submissions is Monday 28th February 2011.